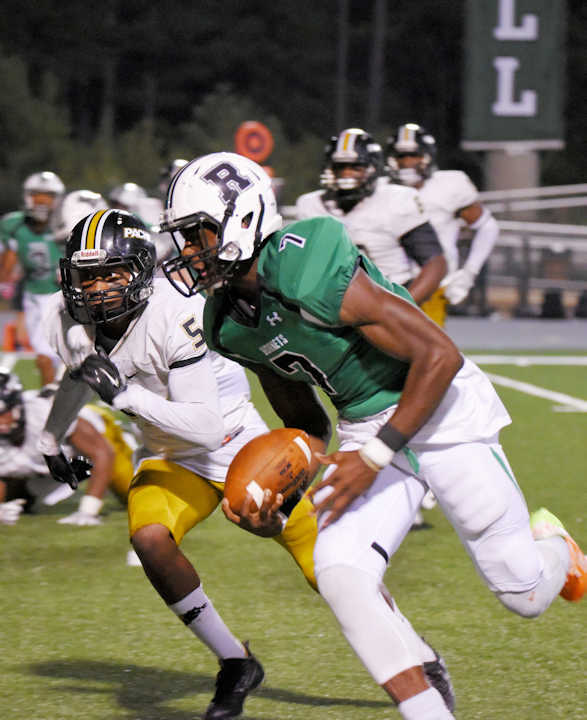 ROSWELL—The Hornets built on their undefeated run so far this season as they triumphed over Colquitt County High School on Friday in a 34-3 blowout of the two-time defending state champions. 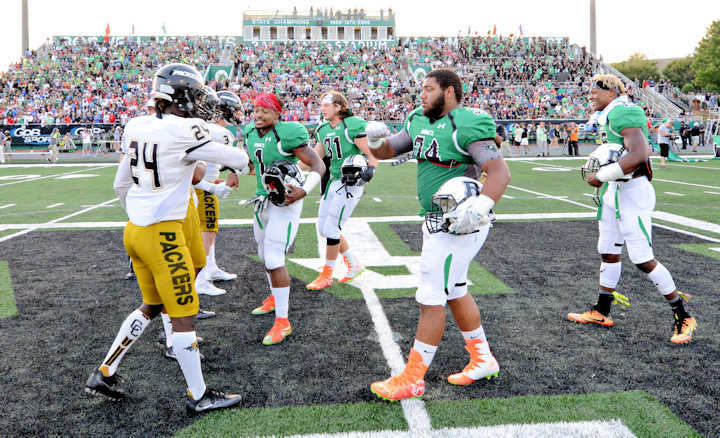 The matchup brought these two teams back together again in a reunion of last year’s State Championship game. Roswell ended its otherwise undefeated season that year at the Georgia Dome with a 30-13 loss to the Packers. This time around, though, Roswell got payback and then some. Friday’s game was the first time this season that the Hornets denied their opponents a single touchdown. It also marks Roswell’s largest margin of victory thus far this season. The opening minutes of scrimmage were no blowout, though. 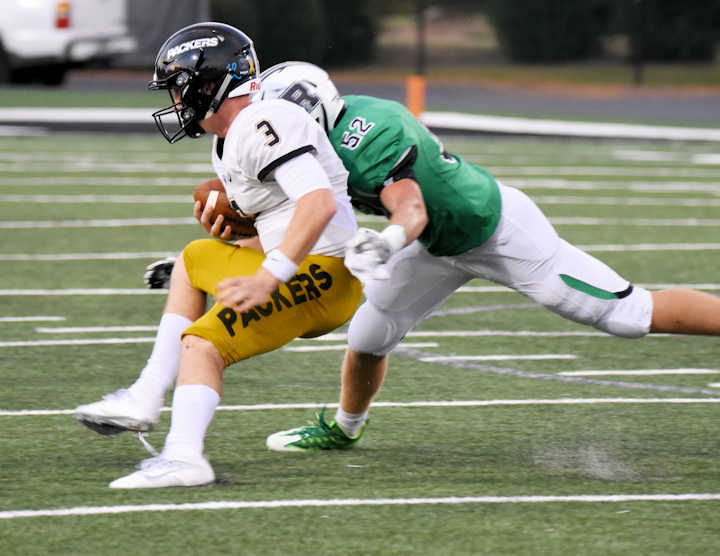 Instead, these two giants of Georgia high school football sized each other up in an inch-for-inch battle. After trading possessions a few times, Roswell’s breakout came midway through the first quarter. In a lightning-quick drive of just under a minute and a half, senior Corey Reed took a rocket of a pass from senior QB Malik Willis 29 yards to the endzone for the first score of the game and a 6-0 lead. Colquitt looked to be well on the way to earning a touchdown of their own toward the end of the 1st with goal-to-go, but senior defensive lineman Max Boyd forced a fumble that was recovered by senior linebacker Mitch Stone to stop the Packer momentum and reverse the tide. From the second quarter on out, senior running back Sheldon Evans added to the Hornets’ lead with a dominant ground game that lasted to the final whistle. He topped off a 47-yard run into Colquitt territory with a 23-yard reception from Willis for his first touchdown of the night and a 13-0 lead midway through the second period. 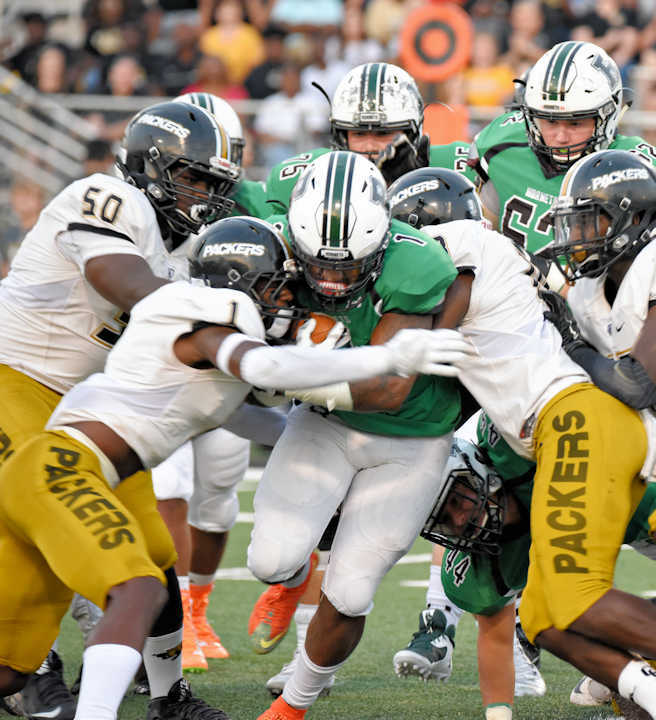 Colquitt threatened to score again right before halftime after a Roswell fumble set the Packers up at the Hornets 4 yard line. An airtight defensive line, however, denied Colquitt the endzone and forced the Packers to settle for a field goal, their only score of the game. In the third quarter, the Hornets first possession resulted in another touchdown, this time on a Willis scramble into the endzone from 13 yards out to bring the score to 20-3. Later in the third, Evans would score his second touchdown of the evening, this time from a 19-yard burst up the middle right through the heart of the Packer defense to make the score 27-3. 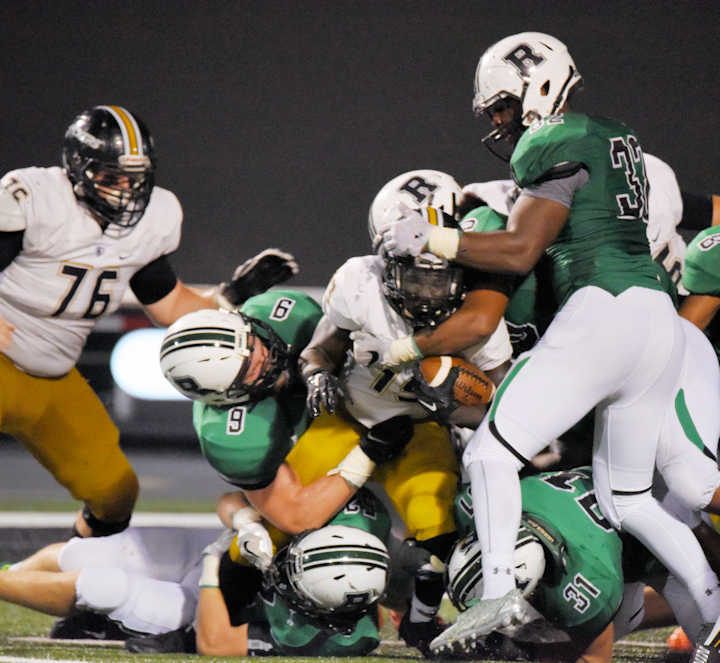 In the 4th period, Roswell would cap the scoring for the game at 34-3 when Evans once again blew through the Packer defense from 18 yards out for his third touchdown of the night. 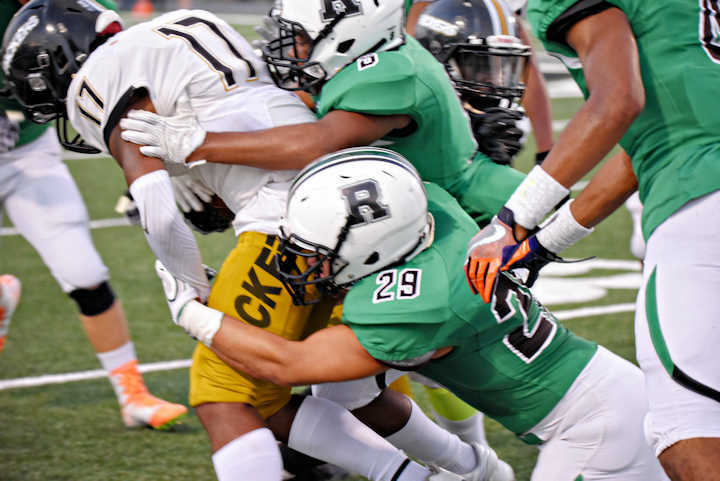 As with every game so far this season, Roswell’s solid offense was backed up by equally impressive efforts on defense. 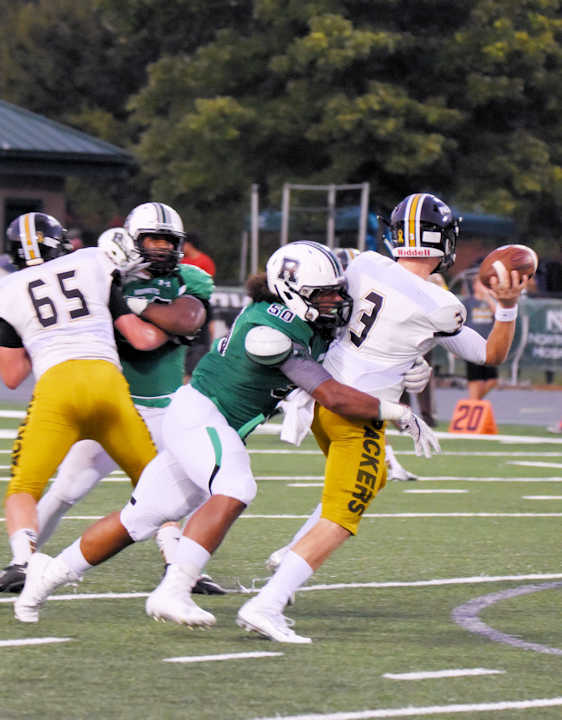 In addition to the forced fumble and dominant goal line stand from the first half, the Hornets were able to force a Colquitt punt on fourth down with 34 yards to go, which was set up by a huge sack for a loss of 15 yards by junior linebacker Tyneil Hopper. Senior defensive lineman LaMon Titus and Sophomore defensive lineman Jajuan White kept the pressure up in the 4th by adding sacks of their own to the total and keeping the Colquitt County offense in check for the rest of the game. Next week is a bye week, but after that the Hornets will hit the road, squaring off against Archer in Lawrenceville on Sept. 23. 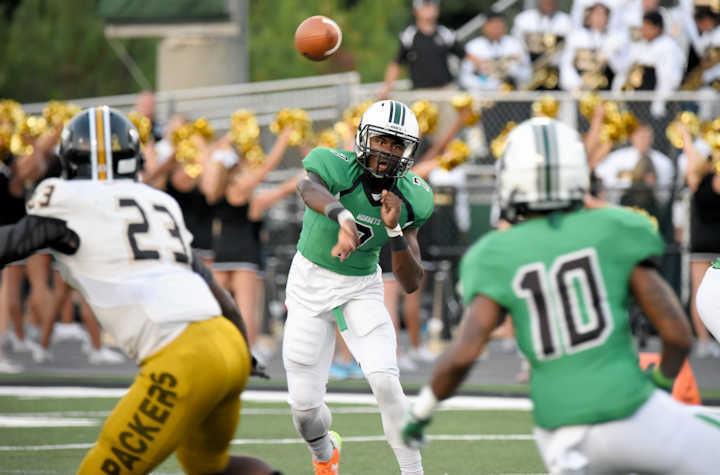 On Sept. 30th, Roswell heads to Milton to write another chapter in one of Georgia high school football’s greatest rivalries.